Do you want to explore Chicago like a local? Then keep reading as I have some tips for you that will make you hit the right spots and save some money on the way. 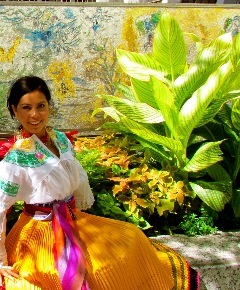 Explore Chicago with a friendly, knowledgeable Chicago Greeter as your guide! Visitors are matched with one of over 200 enthusiastic volunteer Greeters who love sharing their expertise and passion about the city and all there is to see and do here. I have used this service before and it was totally worth it! Remember that you need to register 10 business days in advance for a FREE 2-4 hour guided visit of a neighborhood or special local interest of their choice. Did you forget to register in advance? No problem! Chicago Greeter also offers a free walk-up InstaGreeter service from the Chicago Cultural Center year-round. This is perfect for visitors with some free time on their hands, or for those unable to register in advance. 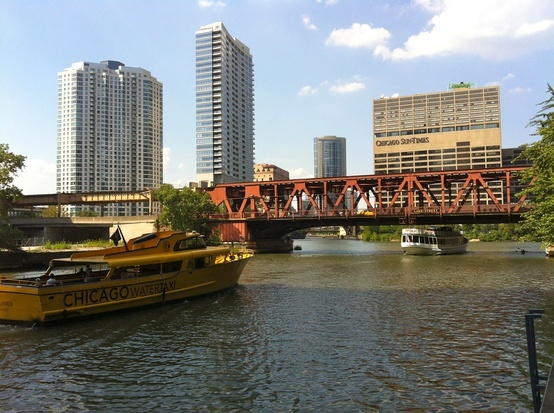 This is a great way to explore Chicago and enjoy views of the Chicago Riverwalk. The Riverwalk features public walkways and seating areas along the water’s edge, where visitors can enjoy incredible views of the Loop’s mountain range of skyscrapers, while watching the boats go by. The Chicago Water Taxi offers a fun, fast and friendly direct link from the Metra and Amtrak commuter train stations at Madison Street to Michigan Avenue, the Magnificent Mile, River North Arts District at LaSalle Street and Chinatown. This is also a good alternative to the Chicago River Tours if you are on a budget. I personally enjoyed the water taxi ride more than my experience at one of those tour boats. One-way fares start at $2. For schedule and complete fare details, visit their website here or call 312.337.1446. Instead of going to Willis Tower (formerly known as Sears Tower) and paying some bucks to access its observatory, invest those bucks on a drink or a dessert at the Signature Lounge on the 96th floor of the John Hancock Building and enjoy a beautiful view of the city while doing it . But here is the scoop: All these places (except for the Skydeck and the Observatory) offer free-access days. So, if you have time, you can visit them for free. Check the list for Museums free-days here. Also, if you know someone who lives in Chicago and has a library card, get her/him to get you free passes to museums from the library. Millennium Park is located in the heart of the city. The park is managed and programmed by the Chicago Department of Cultural Affairs and Special Events, is an award-winning center for art, music, architecture and landscape design. I have great memories of fabulous concerts that I have attended here. Check their website for information for upcoming events. CHECK OUT THE LAKEFRONT FOR SURE! 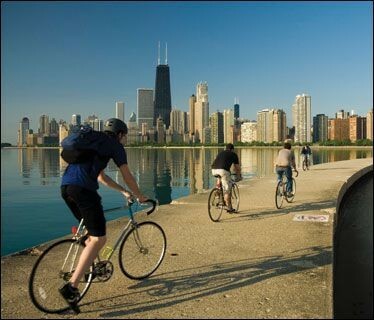 And if you can, bike along the Chicago Lakefront Path (Lake Michigan shoreline running through Southshore, Jackson, Burnham, Grant, and Lincoln Parks. This experience will surely make you feel like a local. This is a prized place shared by all Chicago residents. The path system unites differing ethnic and socioeconomic neighborhoods such as Southshore, Hyde Park, Lincoln Park and Lakeview, and it serves as both a recreational and transportation resource to them all. …unless you want to get on the Chicago Ferris Wheel, you want to see the fireworks show offered on Wednesdays and Saturdays during the summer, you are going to the Shakespeare Theater, or there is a special event going on. Navy Pier is good to enjoy views of Lake Michigan and the beautiful skyline of the city. But you can also find outstanding views without the crowds that congregate there at Museum Campus or North Ave Beach.